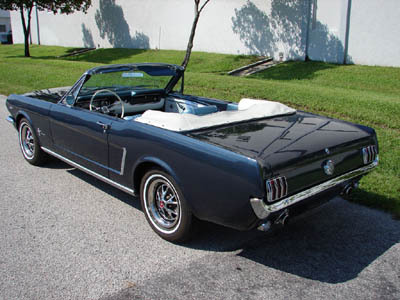 The 1966 Ford Mustang Convertible - Summertime Fun ! Ahhh ! Cruising in a 1966 Ford Mustang convertible in the sunshine with the top down on a perfect sunny day. Does life get any better than that ? Ford's classic Mustang convertible epitomizes the definition of an icon. Now you may find someone who prefers a different year or make, but it's hard to find anyone, seeing a nice clean 66 convertible and saying anything other than that's a great car.! 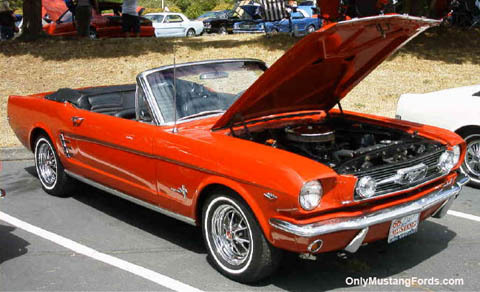 There were not many changes to the already popular overall specifications and styling as compared to some other versions of the pony car, which can make the 1966 Ford Mustang convertible somewhat difficult to identify at first glance their differences from the first 1965 convertibles. For instance, where on a 1966 coupe, the original chromed side intake "comb" changed into a 3 prong unit, the 1966 Ford Mustang convertible cars, like the fastback models, did not feature a chrome "comb" in either the 1965 or 1966 models. One of the easiest ways to identify the '66 models from the front is the change in the front grille. 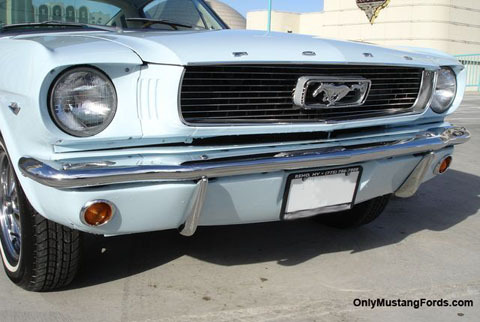 1965 cars featured a blue-grey honeycomb mesh grille, while the 1966 Mustangs made their debut with a new horizontal slat design. 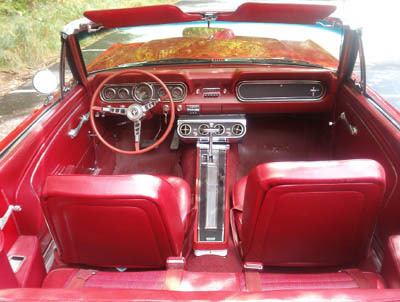 The 1966 convertible, like its 1965 Mustang predecessor was an instant hit, selling 56,409 cars as a standard convertible, 12,520 units as a "luxury" option and another 3,190 cars as one of the rare 1966 cars with a bench seat option instead of the standard two bucket seats. 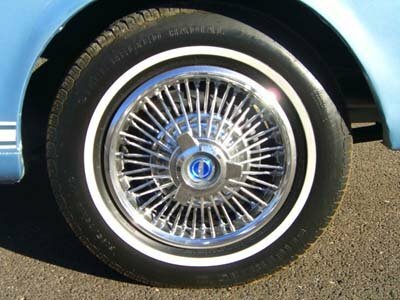 Some of the most sought after convertibles came equipped with the classy wire wheel option with its simulated knock off hubs. And of course, the powerful 289 V8 option makes these drop top cars even more valuable and desirable. The Engine choices included the 200 cubic inch six, which produced 120 horsepower. 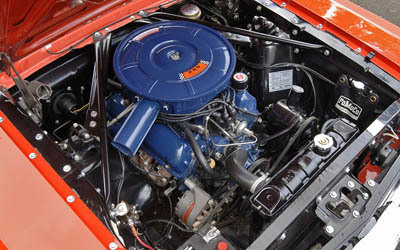 The base 289 V8 2 barrel carburetor engine, produced 200 horsepower, with an optional 289 cubic inch V8 High Performance engine and 4 barrel carburetor upping output to a solid 225 HP. The special High Performance (hi-po) or K-Code 289 cubic inch 4V engine with a high engine produced, a very strong for the time, 271 horsepower. And with only 2,500 lbs to throw around, this combination made for a very quick convertible by anyone's standards. 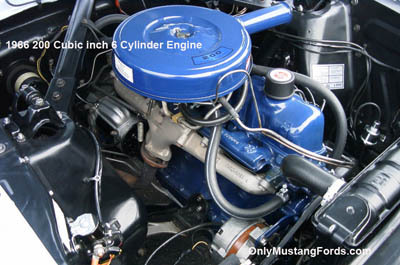 One of the changes in the engine bay, not related to horsepower, but nonetheless important, when restoring a classic Mustang, was the change in engine color, from the iconic Black engine block and Gold valve covers, to the now corporate Ford blue on both. Any way you look at it, this car was, like it's 1965 cousin, an instant classic, which gets as many looks (maybe more) now as it did when it appeared in showrooms as a 1966 model. And thankfully, due to the efforts of enthusiasts like you, it will continue to be enjoyed by many generations of Mustang fans for generations. 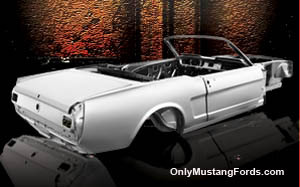 Produced by the folks at Dynacorn, who know their way around Mustang parts reproduction, officially licensed 1966 Mustang convertible bodies are now available. This brings some interesting restoration possibilities that were pretty much impossible until now. That old rust bucket that wasn't worth fixing but had some of the most desirable options ( say k-code engine, console, 4 speed, trac loc differential, maybe even an interior that was in great shape) is now able to be restored to almost new condition. Or you've always wanted a convertible but can't afford the price of a drop top car. All of a sudden that could be possible. Pricing isn't cheap at approximately $15,000, but its a real bargain when you look at what it would cost to have a professional restoration shop rebuild the car from parts or take the hours, parts, stripping and welding needed to fix a too far gone convertible.